This delicious twist on southern classic banana pudding is perfect for the next pot-luck! Mix pudding package with milk. Stir to fluff and add sour cream and 1/2 cup whipped cream. Layer pudding in the bottom of the serving dish. Top with a layer of whipped cream. Sprinkle with crispy sugared pecans. Repeat until serving dish is full. 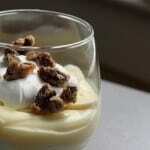 Top with whipped cream and crispy sugared pecan pieces for garnish. Keep cold until ready to serve.